Divani Collection Hotels is proud to announce that the group has won two titles at the Europe Gala Ceremony of the 25th World Travel Awards 2018, held on Saturday 30th June at the Zappeion Megaron Hall. 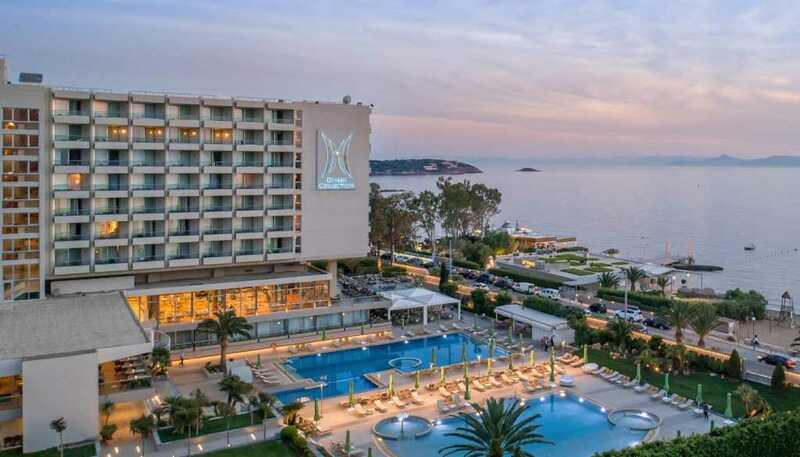 The Divani Collection Hotel Group won the title of Greece’s Leading Hotel Group 2018 whilst the Divani Caravel Hotel received Greece’s Leading City Hotel 2018. Furthermore, founder of Divani Collection Hotels Aristotelis Divanis was honored with a special WTA Lifetime Achievement Award, marking his 60 years in the industry as a leader of Greek hospitality. The awards come at a significant time as Divani Collection Hotels celebrates its diamond anniversary throughout 2018. For more than 60 years Divani Collection Hotels has been established as a leader in luxury hospitality, and has a rich and illustrious history. Founded in 1958 by Aristotelis Divanis, Divani Collection Hotels remains one of Greece’s most prominent, family-owned hotel groups. The luxury hotel group is proud to have been honored with the coveted title of Greece’s Leading Hotel Group 2018 by the World Travel Awards, an accolade which reflects its leadership in the Greek tourism sector. The additional recognition of Aristotelis Divanis’ contribution to the Greek hospitality sector with a WTA Lifetime Achievement Award is a reflection of his tireless work in the tourism business, as well as his unique personal importance to the national hotel industry. With his strong entrepreneurial spirit combined with a love of authentic, warm hospitality, Aristotelis Divanis launched his first hotel in Trikala, central Greece, in the late 1950s. He quickly went on to become one of the leading hoteliers in the country, with the development of new properties in Meteora, Larissa, Athens and Corfu. Each property showcases its own distinct character and identity whilst offering the uniformly high standards exemplified by the Divani Collection Hotel Group. The inclusion of the Divani Apollon Palace & Thalasso and Divani Caravel into the ranks of the prestigious Leading Hotels of the World reflects the prominent international recognition achieved by the group, and marked its entry into the global hospitality elite. The Divani Caravel Hotel, a member of the Leading Hotels of the World, offers luxury and style for business and leisure visitors alike. Located just minutes away from all the major cultural sites and attractions of the city center, the hotel’s 471 rooms, including 87 executive rooms and 44 suites, offer an appealing blend of contemporary conveniences and classical charms. The title of Greece’s Leading City Hotel 2018 reflects the hotel’s position as a landmark of the Athenian hospitality scene and a favorite home-away-from-home for royalty, world leaders and countless celebrities. With a breathtaking rooftop pool offering stunning views of the Acropolis and Lycabettus Hill, as well as a beautiful spa, state-of-the-art business facilities and three flawless restaurants serving the finest Greek and international cuisine, the Divani Caravel Hotel invites guests to experience unparalleled levels of luxury in the perfect downtown location. Divani Collection Hotels is honored to have been recognized over the years by some of the most reputable industry groups and respected publications in the world for excellence in luxury hospitality. Whether recognized by industry leaders or guests, these awards reflect the commitment of Divani Collection Hotels to setting the standards for excellence in service, as well as the dedication of its employees to providing the ultimate guest experience. Known as the ‘Oscars of the travel industry’, the World Travel Awards were established in 1993 to recognize and celebrate excellence in the tourism industry. Today, the awards are recognized as the benchmark of exceptional quality, with winners setting the standards to which all others aspire. This year’s glittering Europe Gala Ceremony 2018 took place in a red-carpet event at the Zappeion Megaron Hall, with more than 300 guests representing the elite of the European hospitality industry in attendance. The World Travel Awards are the most coveted awards in the travel and tourism industry, with more than 200,000 industry professionals from around the world participating in the voting process.